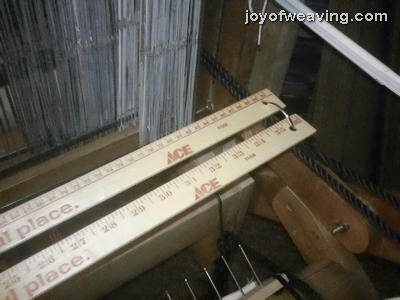 Lease sticks are important for maintaining the cross in warp threads. An inexpensive alternative to heavy commercially made ones, and easy way to make, are wooden yard sticks, the kind that usually have the hardware store logo on them. They are light weight and somewhat bendable. Commercially made lease sticks are usually heavy and made of a hard wood. Lease sticks are best when they are light weight and bendable. I like to weave with them in (close to the back beam) because if a warp should break, it is much easier to find it and the corresponding heddle. It's also good if they're bendable because if a twist should occur in the warp, the sticks will bend which prevents warp thread breakage. They're inexpensive and easy to make. I made 2 pairs for under $5.00. Drill a hole in each end, sand and either paint or seal with varnish. You want them to be as smooth as possible. 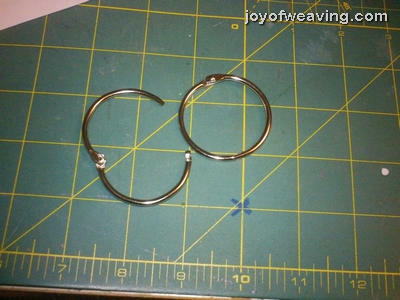 You need the holes in each end to tie them together, but rather than tie or otherwise lash them together with string, give book binder rings a try. They are most convenient. They are found at most office supply stores. Enjoy your new lease sticks!